Considerable variation in the clinicopathologic presentation of epithelial odontogenic tumors can sometimes be confusing and increase the chances of misdiagnosis. The differential diagnoses of radiolucencies that occur in the maxilla and mandible include a broad spectrum of cysts and tumors of odontogenic and nonodontogenic origin. Adenomatoid odontogenic tumor (AOT) is a distinct benign (hamartomatous), noninvasive slow growing odontogenic tumor. It accounts to about 2.2-7.1% of all odontogenic tumors. It was first described by Steensland in 1905. In 1969, Philipsen and Birn  proposed the term AOT and were first adopted by the 1 st edition of WHO classification of odontogenic tumor. According to the 2 nd edition of WHO "Histological Typing of Odontogenic Tumors, Jaw Cyst and Allied Lesions" in 2005  AOT is defined as "A tumor of odontogenic epithelium with duct-like structures and varying degrees of inductive change in the connective tissue. The tumor may be partly cystic, and in some cases the solid lesion may be present only as masses in the wall of a large cyst." There are three variants of AOT: Follicular, extra follicular, and peripheral. Follicular type is associated with an impacted tooth and accounts for 70% of cases. Extrafollicular type is not related to impacted tooth and accounts for 25% cases. Peripheral type is rare and arises only in the gingival tissues. This case paper aims to describe an unusual case of AOT, originating in the maxillary sinus of a 17-year-old female. A 17-year-old female patient reported with the chief complaint of swelling of the right side of the face since 3 years. The swelling had been present from past 3 years and had gradually increased to attain the present size. Past dental history revealed extraction of maxillary anterior tooth. Extraorally, a diffuse swelling, resulting in facial asymmetry was present in the right maxillary region lateral to the nose extending up to the infraorbital region. It was irregular in shape and measured approximately 2-3 cm in diameter. Intraorally, buccally, the swelling extended from the distal surface of the right maxillary central incisor to the right maxillary first premolar, obliterating the buccal vestibule [Figure 1]. Palatally, swelling extended up to the midline of the hard palate. Patient was subjected for radiological investigations. Paranasal sinus view and axial computed tomography (CT) scan showed hyperdense expansile area in right antrum causing the expansion and thinning of the maxillary sinus walls with an unerupted tooth near the lower border of the orbit [Figure 2]a and 2b]. 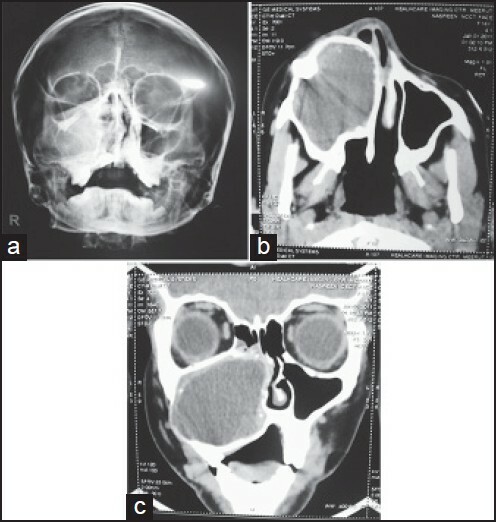 Coronal CT showed hypodense area in the right antrum causing thinning of the lateral wall and perforation of the medial wall of the maxillary sinus, extending superiorly into the ethmoidal sinus with deviation of the nasal septum and complete obliteration of the nasal fossa [Figure 2]c]. An incisional biopsy was performed, and the patient underwent surgery under general anesthesia. 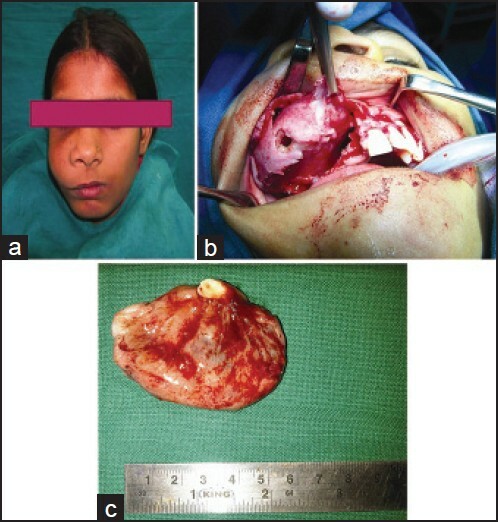 A mucoperiosteal flap was raised; resorption of the buccal cortical plate was noted; the whole tumor mass was enucleated along with the impacted teeth [Figure 1]a and b] and the specimen was sent for histopathological examination. Healing was uneventful. The radiographic follow-up examination after 6 months revealed no local recurrence. Microscopically the lesion showed a highly cellular tissue made up of cuboidal and tall columnar cells arranged in whorl-like pattern. Microcystic areas with homogeneous eosinophilic material could be appreciated in some regions. Connective tissue was scanty showing blood vessels with extravasated blood. The overall picture confirmed the diagnosis of AOT [Figure 3]. Clinical features generally focus on complaints regarding a missing tooth. The lesion usually presents as asymptomatic swelling, which is slowly growing and often associated with an unerupted tooth, diagnosed in the second decade of life and women are twice as commonly affected than men. Highest ratios are found in Asian populations, highest incidence in Sri Lanka (3.2:1) and Japan (3:1)  and twice more common in maxilla than mandible, with the anterior aspect twice more commonly affected than the posterior. The radiographic findings of AOT frequently resemble other odontogenic lesions such as dentigerous cysts, calcifying odontogenic cysts, calcifying odontogenic tumors, globulo-maxillary cysts, ameloblastomas, odontogenic keratocysts and periapical pathosis. , The usual radiographic feature is a well-defined radiolucency with corticated or sclerotic border. Internally, radiopacities develop in two-third of cases. One tumor may be completely radiolucent, other may contain faint radioapaque foci, and some may show dense clusters of radiopacities, sometimes appearing as small pebbles. Displacement of neighboring teeth due to tumor expansion is much more common than root resorptions. ,, To acquire additional information of AOT, CT, ultrasonography, and magnetic resonance imaging, should be performed, as these imaging modalities correspond to the macroscopic findings of the histopathological examination. Immunohistochemically, the classical AOT phenotype is characterized by a cytokeratin (CK) profile similar to follicular cyst and/or oral or gingival epithelium based on positive staining with CK5, CK17, and CK19. On the other hand, the classical AOT is negative for CK4, CK10, CK13, and CK18. Takahashi et al. observed a positive staining for iron-binding proteins (transferring, ferritin) and proteinase inhibitor (alpha-one-antitrypsin) in various cells of AOT indicating their role to the pathogenesis of AOT. Finally, Gao et al. studied the expression of bone morphogenic protein. Treatment includes complete surgical excision because the tumor is noninvasive, encapsulated, and is separated easily from the bone. Recurrence rate is 0.2%. The treatment of choice is enucleation and simple curettage, but in case of large tumors partial resection, en bloc of jaw has been suggested. Use of lyophilized bone and guided tissue regeneration has been indicated in cases where removal of the lesion leaves a large exposed bony cavity. Many cases have been reported affecting maxilla,  mandible,  and few cases affecting maxillary sinus,  but none so far has been reported with the extension into ethmoidal sinus along with the involvement of antrum. Normally the tumors do not exceed 1-3 cm in greatest diameter. Our case revealed a large, gigantic tumor in 17-year-old female patient which initially was slow growing, but exhibited noticeable growth since the last 2 months. The CT scan revealed destruction of the medial wall of right antrum with involvement of the ethmoidal sinus on the ipsilateral side, deviation of the nasal septum and complete obliteration of the nasal cavity. Complete excision of the tumor along with the tooth did not show any resorption of roots. Some large tumor has been associated with a recurrence which might indicate its neoplastic nature. Taking all the controversies surrounding it into account, our patient are under regular 8 months follow-up with no recurrence observed till date. 1. Balwani SR, Barpande SR, Tupkari JV. Peripheral adenomatoid odontogenic tumor. J Oral Maxillofac Pathol 2007;11:28-31. 2. Steensland HS. Epithelioma adamantinum. J Exp Med 1905;6:377-89. 3. Lucas RB. Pathology of Tumors of the Oral Tissues. 4 th ed. Edinburgh, Scotland: Churchill Livingstone; 1984. p. 66. 4. Kramer IR, Pindborg JJ, Shear M. WHO International Histological Classification of Tumours. Histological Typing of Odontogenic Tumors. 2 nd ed. Berlin: Springer Verlag; 1992. 5. Batra P, Prasad S, Parkash H. Adenomatoid odontogenic tumour: Review and case report. J Can Dent Assoc 2005;71:250-3. 6. Philipsen HP, Reichart PA. Adenomatoid odontogenic tumour: Facts and figures. Oral Oncol 1999;35:125-31. 7. Sandhu SV, Narang RS, Jawanda M, Rai S. Adenomatoid odontogenic tumor associated with dentigerous cyst of the maxillary antrum: A rare entity. J Oral Maxillofac Pathol 2010;14:24-8. 8. Handschel JG, Depprich RA, Zimmermann AC, Braunstein S, Kübler NR. Adenomatoid odontogenic tumor of the mandible: Review of the literature and report of a rare case. Head Face Med 2005;1:3. 9. White SC, Phaorah MJ. Oral Radiology. Principles and Interpretation. 5 th ed. St. Louis: Mosby; 2004. p. 431-3. 10. Chuan-Xiang Z, Yan G. Adenomatoid odontogenic tumor: A report of a rare case with recurrence. J Oral Pathol Med 2007;36:440-3. 11. Takahashi H, Fujita S, Shibata Y, Yamaguchi A. Adenomatoid odontogenic tumour: Immunohistochemical demonstration of transferrin, ferritin and alpha-one-antitrypsin. J Oral Pathol Med 2001;30:237-44. 12. Gao YH, Yang LJ, Yamaguchi A. Immunohistochemical demonstration of bone morphogenetic protein in odontogenic tumors. J Oral Pathol Med 1997;26:273-7.